Browse the current Sedano’s Flyer Sale, valid April 17 – April 23, 2019. 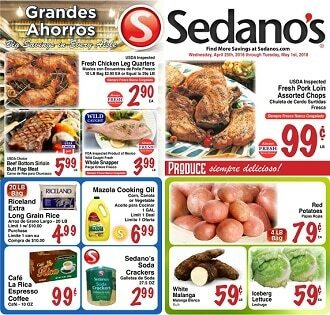 Save with this week Sedano’s Ad specials, printable coupons and Latino food & grocery savings. Find super savings for fresh produce, pasta, tomato sauce, household products, seafood, ice creams, FDA Inspected Fish & Seafood, Assorted Varieties Natural Juices, Dietz & Watson Mozzarella Cheese, Fiorucci Imported Serrano Ham, USDA Choice Certified Angus Beef New York Strip Steak, Green Plantains, Cafe Cachita Expresso Coffee.